It’s been said that Troy Jackson is a highly self-motivated professional in his personal work, as well as a highly motivational art educator. As a ceramicist, he has not only taken the initiative to develop himself artistically, but has used his technical talents to construct and fire using his own kilns. 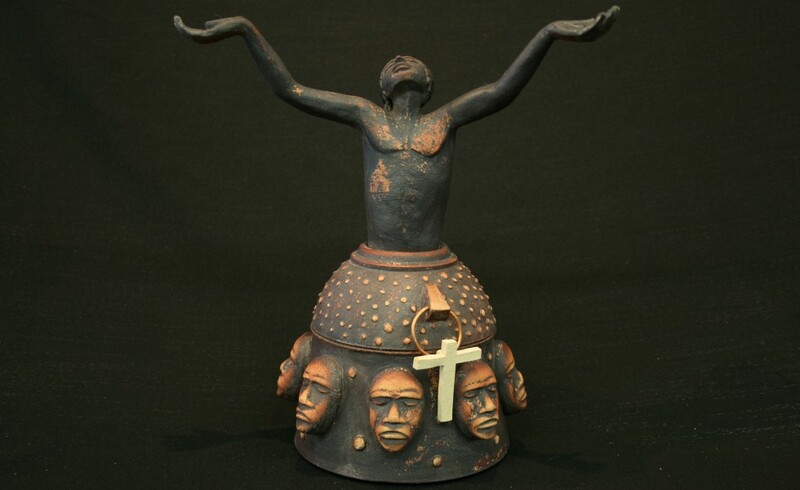 Operating off the beaten path of easily available supplies and equipment, he has proved incredibly resourceful and flexible in the creation and manufacture of his ceramic pieces. Troy is also a very talented 2-D artist, working in a variety of media. A native Oklahoman, the award winning Cherokee artist received his Associates’ degree from Bacone College in Muskogee, a Bachelor of Arts degree from Northeastern State University in Tahlequah, and later completed a Master Of Fine Arts program at the University of Arkansas in Fayetteville. This extended education opened the door for many diverse studies in which Troy has no hesitancy in applying to art. His hand-built and wheel-thrown vessels not only signify a Southeastern motif but also express a Spanish, French and European influence. Clay sculptures have now become Troy’s choice of media as well as a near perfect means to express him-self in today’s society, along with family, culture, and most of all enjoyment. “I love to work in clay, the artist says, although sometimes it’s not very forgiving. However, I find it to be of great satisfaction when it finally gives in and becomes what I intentionally wanted it to be: a piece to be proud of.” And proud is what the artist should be. Troy’s sculptures have won numerous awards throughout the region. One such occasion produced a Grand Award at the 16th Annual Cherokee Homecoming Art Show in Tahlequah, which is considered one of the most prominent annual art shows in Oklahoma. Another Grand Award was also given to the artist from another of Oklahoma’s oldest and prestigious art show, the 40th Annual Trail of Tears Art Show. Troy has also been awarded many first place, second place, and third place awards in both sculpture, 2-D drawing, and contemporary pottery from other exhibitions arranged by such organizations as the Five Civilized Tribes Museum in Muskogee, the Catoosa Art Market Show in Tulsa, the Holiday Art Show in Tahlequah, and many more.